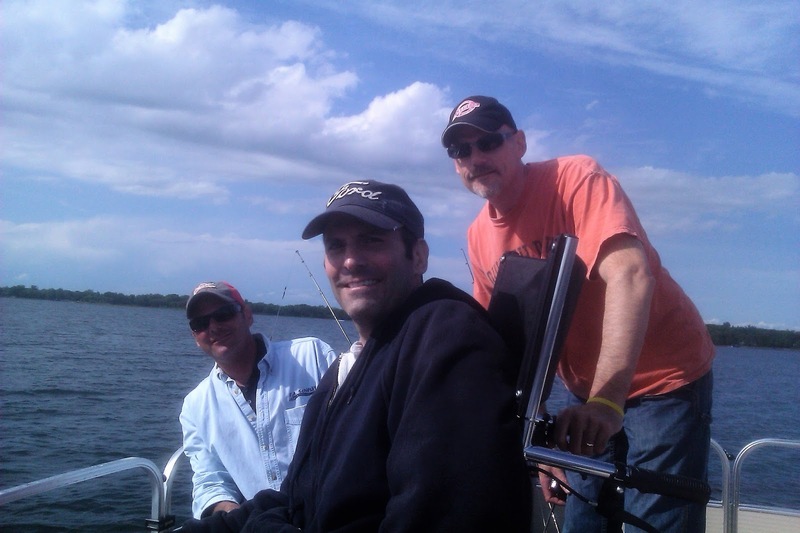 Well the fishing event with Rob, Keith and the brothers was a rousing success. I cannot believe how well everything went from start to finish. We started at Rob's place where the wheelchair accessible van met us at 2:30. Rob's wheelchair was rolled into the van and then I packed our gear and rode along with him and the driver. Rob commented how nice it was to not have to do four "lifts" from his chair into and out of the van. Those manuevers really tire him out. We got to Tally's Dockside right about 2:45. As we were waiting for Tom, Paul and Keith to show up, I heard a beeping alert on the radio inside the fishing office. There were tornado watches in effect for Scott and Carver counties, a few counties to the southwest. My first thought was, here we go, we get this far and then the weather doesn't cooperate. Then after Tom rented the pontoon with a 40 hp engine, (it was a dog and moved at the speed of a Mississippi barge) the owner told him "You see any lightning, and I need you to come right in." More thoughts of dread ramped up again. The clouds we saw sure looked ominous and surely there would be some lightning at some point. After we wheeled Rob down the ramp, we all got on board and got situated. I set Rob's line up with a slip bobber and a small jig that Paul gave us. I topped the jig off with I rigged up my own line next the same way. We were out for crappies, but like always, would take anything with fins. About 20 minutes into our fishing Rob landed his first fish, a small crappie. I've never been so glad to see a small crappie in my life! I was hoping for more and bigger fish, of course, but thought at least he wouldn't get skunked on the day. And they came hard for about 20 minutes. We pulled Rob under the canopy and all gathered together under the small roof. (I joked that it was more like a landau roof, as it made for a cozy few minutes together.) The nice thing about the rain was it cleared the lake of a lot of boats, which gave us room to move about. Later in the day, Rob managed to land a 17 inch largemouth bass that was a beauty. Bass season hadn't started yet, so we had to throw it back after a few pictures. He also managed to land a small northern pike, a perch and a nice fat sunfish to finish out the day. He not only caught the first and the most but he managed to catch 5 different species of fish. Coincidence, or some sort of mystical intervention? I'll leave that up to you. I know what I think. 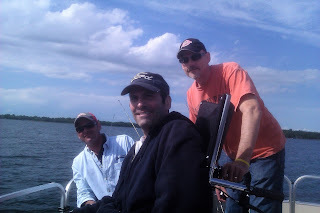 Meanwhile, the rest of us all caught fish, except Keith who always seems to struggle to catch when we fish with him. I really think he enjoys being around us and, hey, a boat ride with your friends and a few beers beats pretty much anything. I landed two largemouth bass (and lost a third fish of unknown species.) Tom lost a fish and managed to get a northern to finish out the day. Paul also got a nice largemouth to his credit. On top of the plentiful fish, we saw a number of loons and even an eagle soaring overhead, a rarity for that close to the cities, I imagine. Rob mentioned after the fact that while we were all joking and talking in the boat, he was just taking it all in. I cannot help but feel that the hand of God was present throughout the trip. Everything from the weather, to the fish, to Rob's health, to the accessibility, even down to the loons and eagle. Lord knows we had enough people praying for the situation. When all was said and done, it was the Boundary Waters without the serenity and seclusion. It was as close as we could hope for, given the circumstances, and I thank God for all of it.